In an article more than three years ago, I first introduced many readers to the concept of “pink slime” and ammonia in meat. Despite the fact that many years has passed since this was written, not much – or not enough – has changed. While some fast food restaurants have banned “pink slime,” ammonia-laden meat has once again made national headlines. So it is time to run this again and re-start the discussion. I’d like to tell you a story. It’s a story that may shock you if you haven’t heard it already. A story rich in drama, intrigue and cover-ups. One that involves you, if you eat fast food, and one that involves your kids if they eat school lunches. A story that you should care about even if neither of the above is true. A story that may seem to be science fiction, but sadly, is true; it was reported in the New York Times on December 30, 2009. It is a story that reflects the current state of food in America and its impact on our health. Once upon a time, there was a beef processing company called Beef Products Inc. who was, as most companies are, looking to make more money. They wanted to try to find a way to take the fatty meat trimmings that could only be sold for pet food or cooking oil and create a product they could use to enter the hamburger business. But because the trimmings were very susceptible to contamination by E. coli and salmonella, they had to find a way to treat the meat scraps so that they would be safe from contamination. So they developed a process to treat the meat with ammonia. Yes, ammonia, the ingredient used in your household cleaner which has a warning on the label regarding breathing or ingestion and information about poison control. Now to be clear, untreated meat has a natural ammonia level that rates about 6 on the pH scale, similar to milk or rain water. But this company found that if they treated the beef with an ammonia process that resulted in changing the pH level to about 10, they could kill the E.coli and salmonella. That is an alkalinity that surpasses the range of most foods. But in the end, the U.S.D.A. not only approved the ammonia processed meat, they were so pleased with the performance of the ammonia process that when they started routine testing of the hamburger meat, they exempted the company, considering their meat safe enough to skip testing. A top lawyer and lobbyist for the meat industry argued on the company’s behalf that another company had just received approval to not disclose a chemical used in treating poultry, so therefore this company shouldn’t have to disclose the ammonia. He won. The Food and Drug Administration approved the ammonia process, considering it safe when used as a processing agent in food. So the company sold its ammonia treated meat to McDonald’s and Burger King and all the other fast food chains, as well as to many grocery stores. In the end, the school lunch officials overcame their objections and decided to use the meat too because it saved 3 cents a pound off the cost of making ground beef. 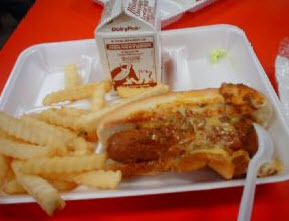 In 2009, the company sold about 5.5 million pounds of the ammonia processed meat to schools alone. And so the company, which does not disclose its earnings, generated an estimated $440 million dollars a year in additional revenue from the trimmings previously unfit for human consumption. And we, as consumers, would probably never have known about this at all, had it not been for a problem. The ammonia process left the meat smelling pungently of ammonia, even as the company produced a taste test saying that some school children preferred the taste of burgers with more of the ammonia processed meat. The company told the U.S.D.A. that it was safe and that when it was diluted with other ground beef and mixed together, it would be fine. The U.S.D.A. accepted this conclusion, so the company was off the hook. But others complained about the smell, too. But in doing so, this left the fatty meat scraps more vulnerable to contamination. And that is where the company surfaced on the public radar. School lunch program testing revealed E. coli and salmonella dozens of times in this company’s meat. There were two back-to-back incidents in August 2009 that concluded two 27,000 pound batches were contaminated, but thankfully they were caught before the meat was consumed by school children. That July, salmonella concerns resulted in a temporary ban of this company’s meat by school officials in Kansas. It was the third time in three years this company’s meat had been banned. But the processing facility remained open and continued to supply other customers (including fast food restaurants and grocery stores) with meat even though they couldn’t sell to schools during that time. When the NY Times broke the story and presented the U.S.D.A. with the information, top officials said that they did not know what their peers in the lunch program had known for years. The agriculture department responded and revoked this company’s freedom from routine testing. It also reversed its policy about pathogens: because this beef was supposedly pathogen free, it was not included in recalls, even when it was found in tainted hamburgers! Food Safety Disconnect — What is Wrong? While in a way I feel we should cheer that there was a response as a result of the NY Times investigation, it’s clear that there is a disconnect between the various divisions of government and that the lack of communication and knowledge exchange is hindering public safety. But more than that, I am concerned that we as a public have become too comfortable with scandal and no longer react. Or that when all of this comes to light, we read it and move on. I have many health conscious friends. When I discussed this with one, he said, “well that is yet another in a long list of reasons why I don’t eat fast food.” And when I said “Yes, but what about your kids eating lunch in school,” he said, “that is yet another reason why I pack their lunches.” I too pack my kids lunches for many such reasons. But what about the kids who are eating there because they are on the subsidized lunch programs or because their parents believe the food they are getting is good or better than what they could come up with on their busy schedules? Does it not upset you to know this is happening? His response was that it is no surprise to him that this stuff goes on based on what he knows about the government and the operation of its agencies, especially regarding food. That they represent agriculture and food companies, not consumers. OK, I know that too. But even knowing that, I still feel we can do better. I still feel outraged that we are allowing substandard food products to replace real food in our diets. Is this what we want to eat? Is this what we think is best to feed growing children? Are we ok with food decisions that are made to save three cents because we deem that more important than health and wellness? It strikes me that it is not dissimilar to the situation in the automobile industry in America. I remember being in a meeting twenty years ago in which there was a discussion over whether saving a half a cent on a screw that would last through warranty (hopefully) was worth it over spending an extra half a cent for the more expensive screw that would last 10+ years. It took awhile, but car manufacturers finally realized that they needed to take a more holistic view: that there were other costs associated with choosing the less expensive screw. Things changed when the decisions were no longer made solely by those focused on short-term immediate costs: when people began to realize there were longer-term costs that had to be factored in as well. We need to change the system and fix the broken processes. When will we take a more holistic view of our food choices and realize that while budgets are tight, some savings are simply too costly to justify? So Why Doesn’t the Government Intervene? The rationale for using ammonia was to treat the meat to prevent pathogens such as E coli. In the report that follows, however, the focus is on chemical contaminants like veterinary drugs and antibiotics, heavy metals (such as copper, cadmium and arsenic), dioxins, polybrominated diphenylethers (fire retardants), and pesticides with cancelled registrations that remain in the meat. The problem with these chemical contaminants is that not only are they not destroyed by cooking, as E coli is, but they can actually intensify when cooked and become even more harmful. The U.S. Department of Agriculture’s (USDA) Food Safety and Inspection Service (FSIS) administers the national residue program. The FDA (Food and Drug Administration) and the EPA (Environmental Protection Agency) each play a key role in the process and in addition, they established a joint Surveillance Advisory Team (SAT) and an Interactive Residue Control Group (IRCG) to help reach their program goals. Each year, the SAT is supposed to call on the FDA, the EPA and FSIS to determine what residues they will be testing for that year. Despite the fact that they convene and form a joint consensus, each year the FSIS continues to only test for one type of pesticide. For any testing that does occur, the FDA must approve the proper testing methods. However, the FDA continues to make use of antiquated testing methods and has continually been unwilling or unable to use newer testing methodologies. The methods employed by the various agencies are often in conflict with each other, which is why the SAT was created to begin with: to help them coordinate and communicate to make it happen. But year after year, no progress seems to be made. The report concludes there is a problem and that improvements must be made. Not surprisingly, this did not make headlines! One of the concerns highlighted is the practice of cow ‘recycling.’ When a dairy cow gets too old or sick to produce any more milk, they are slaughtered and the ‘spent’ dairy cow meat makes it way into our meat supply. This causes concern because of the hormones, antibiotics, and pesticides present within the meat fat of those cows. A 2008 investigation revealed that 90% of the residue violations occurred in plants that process the spent dairy cows. Another concern highlighted in the report is the fact that livestock are now being fed industrial waste that remains after the process of converting corn into ethanol fuel. The remains are known as ‘distillers’ grains.’ The USDA is aware that they are more likely to contain E coli, but they do not choose to regulate the use of distillers’ grains in cattle feed. The ethanol fermentation process requires a lot of antibiotics as well, so those residues also remain in distillers’ grains. In addition, they are laden with mycotoxins, which are linked to an imbalance in pigs called Mulberry Heart Disease, which can cause sudden death. In the end, because there are no regulations and testing is not being done, this meat ends up in our food supply and the more tainted it is, or the lower the quality, often, the cheaper it is. That makes it more appealing to fast food restaurants, big chain supermarkets, and of course, our school lunch programs where it is fed to developing children who are even more sensitive to the drugs, chemicals, and antibiotics than adults are. Another section of the report highlighted how the agencies fail to communicate. In one example, the EPA has recently cancelled use of all pesticides containing lindane and will revoke its current lindane tolerance. I don’t quite understand how canceling use of all pesticides containing lindane can be considered not establishing an official tolerance level, but that’s why I don’t work for the government! So what can we do? We continue to hear these stories and maybe we are becoming de-sensitized or we just accept the inability of our government to adequately protect us and our food supply. But there are things we can do. Support local farmers and CSAs where you can meet and know the producers of the food you are eating and ask them questions about their practices. Educate yourself by reading the reports such as the one below and becoming aware of the challenges faced by our current food practices. Vote with your pocket book, and speak out to your representatives: let them know you care about our food supply and the health of our children and you want something better. There’s no point reforming our health care system if we are not changing our farming and food policies: let’s get to the cause and not the symptom. What do you think? And if you are interested in learning more about how the government monitors its agencies, read the Executive Summary below for a taste. One of the public food safety issues facing the United States is the contamination of meat with residual veterinary drugs, pesticides, and heavy metals. “Residue” of this sort finds its way into the food supply when producers bring animals to slaughter plants while they have these residual contaminants in their system. When the animals are slaughtered, traces of the drugs or pesticides contained in these animals’ meat is shipped to meat processors and retail supermarkets, and eventually purchased by consumers. In order to safeguard the Nation’s food supply from harmful residue, the U.S. Department of Agriculture’s (USDA) Food Safety and Inspection Service (FSIS) administers the national residue program. FSIS inspectors sample meat processed through slaughter plants for residue testing and compare the results with tolerances established by the Food and Drug Administration (FDA) and the Environmental Protection Agency (EPA) to prevent adulterated meat from entering into commerce. The Office of Inspector General (OIG) initiated this audit to evaluate the effectiveness of the national residue program and to assess how well FSIS, FDA, and EPA were coordinating to accomplish the program’s objectives. Based on our review, we found that the national residue program is not accomplishing its mission of monitoring the food supply for harmful residues. Together, FSIS, FDA, and EPA have not established thresholds for many dangerous substances (e.g., copper or dioxin), which has resulted in meat with these substances being distributed in commerce. Additionally, FSIS does not attempt to recall meat, even when its tests have confirmed the excessive presence of veterinary drugs. To address these serious shortcomings in the national residue program, FSIS, EPA, and FDA need to take steps to improve how they coordinate with one another to accomplish the program’s mission. Recognizing that they needed to work together to prevent residue from entering the food supply, the three agencies established the Surveillance Advisory Team (SAT) and the Interagency Residue Control Group (IRCG) as a way of coming together to communicate and coordinate. We found, however, that there were a wide range of problems with relying on this process: not all agencies were equally committed to the SAT and IRCG; essential participants were not required to attend; and no one agency had authority to ensure that necessary actions were taken to deal with disagreements. Due to problems with how the SAT and IRCG were established and were functioning, we identified four issues relating to coordination between FSIS, EPA, and FDA. The three agencies involved need to: 1) expand the substances they test for, 2) improve their methodology for sampling hazardous residues, 3) determine more efficient ways of approving newer methods of testing for drug residues, and 4) collaborate to set tolerances for additional residues.